Whether you’re visiting your childhood home, or just in a locale you’ve never previously experienced, a vastly different yet addictively engaging adventure in Kanto awaits! Were this any other review, this paragraph and the one that follows it, would be dedicated to the history of the game that is being review, especially if the game is a new instalment, but after 20+ years of Pokémon, perhaps just this once we’ll skip that and dive right into more recent events. One event in particular, being the top-secret press event that occurred back in late May in which officially revealed Pokémon: Let’s Go, Pikachu! and Pokémon: Let’s Go, Pikachu!. After months of rumours and some genuine leaks, we were finally given a look at what a main series Pokémon game could look like on Switch and it definitely divided the fan base. A divide in which would get bigger and bigger as the months that followed contained new news and information that would bring both joy and hate to Pokémon fans the world over, but all of that is in the past now. What actually matters is how the game actually compares to the main series games we love so much, how it plays and answer a lot of burning questions. First and foremost, Pokémon: Let’s Go, Pikachu! and Pokémon: Let’s Go, Eevee! are enhanced remakes of 1998’s Pokémon Yellow for the Nintendo Game Boy and when I say “remake” I do mean remake and remaster. Let’s Go games aren’t just an elaborate visual upheaval of Yellow, which has been adapted to fit in with this day and age, but they are the original game stripped down to its bare bones before being built anew and having half, if not most of its original mechanics being thrown out or repurposed, in a bid to make the Let’s Go games almost a dead ringer for the mobile phenomenon that we all know as Pokémon GO. Naturally, these new changes aren’t for everyone, but then when it comes to the Let’s Go games, they are actually NOT for die hard series fans. They are intended to provide a more casual experience so that players of the mobile game, can ease into before Nintendo shove a hard hitting and true blue Gen 8 instalment down our throats next year, which the new crowd can enjoy with the rest of us. They are games intended to get mobile gamers to purchase a Nintendo Switch and after having purchased and played Let’s Go, they go on to discover a range of games for them to enjoy and live up the “Nintendo” life for a while. In a sense, they are a cash grab, but the games can actually be construed as being one of the most elaborate and expensive marketing ploys to get everyone talking about Pokémon even more so and create engagement regarding a Gen 8 game that we have yet to see in action. Still, that’s neither here nor now, so how about we actually start talking about the game, starting with what it does and doesn’t have compared to Pokémon Yellow and what’s been changed. Firstly, rivals. It wouldn’t be Pokémon without one and yet, instead of having a rival who wishes to be better than the player and puts them down at every turn, we have one who is the player’s friend, encourages them at every opportunity and will even give you items. As for the names of these Secret Techniques, they are Chop Down (Cut), Sky Dash (Fly), Strong Push (Strength), Sea Skim (Surf) and Light Up (Flash) but those aren’t the worst names discoverable in the Let’s Go games. There are actual new moves called Zippy Zap, Bouncy Bubble, Pika Papow, Floaty Fall, Splishy Splash, Veevee Valley and Baddy Bad. Naturally, the writer in me is appalled by those names, but we not going to descend down the rabbit hole, just so I can go in on a rant about them. Instead, we’re going to move onto the next thing that’s out and it’s the PC system. Essentially, the bag system at play, with items, Pokédex and everything else, is very similar to that of Pokémon GO, except with Let’s Go, the bag now has more screen space to fill out. Furthermore, when going through your Pokémon collection in the bag, players are presented with images of pixelated Pokémon. As for a feature that isn’t gone, but repurposed, is Pikachu following you. 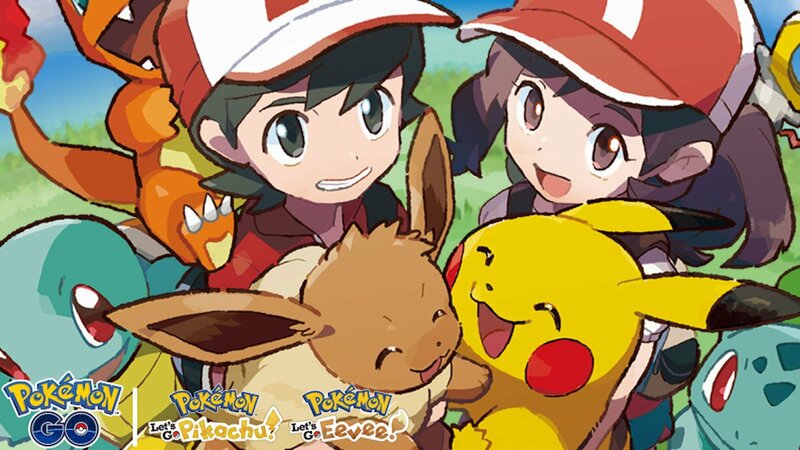 Although your Partner Pokémon will not follow your player when circumnavigating the overworld, as your starter Pikachu/Eevee choose to cling to your shoulder/sit on your head, players do have the option to take their other Pokémon out of their Poké Ball. You can’t have your entire team of 6 wandering freely, as it’s only one at a time in addition to your Partner Pokémon, but should you find yourself engaging in co-op play, the Pokémon who is second in your team, will follow the second player. It’s worth pointing out that players can remove their Partner Pokémon from their team and still have them on your trainer. Back to your starter Pokémon though, like in Yellow, neither Pikachu nor Eevee can be traded. They do have perfect stats though. One of the biggest tweaks changes, is the removal of the Safari Zone, having the Pokémon that once called it home, made discoverable elsewhere all over Kanto and replacing it with GO Park. Being a game that ties in with Pokémon GO and not “just a console port of it,” GO Park is the place to go to connect the Switch game to the mobile game and transfer all the Gen 1 Pokémon you’ve caught over the years. When in GO Park, you will be required to catch those Pokémon again, if you wish to take them out into Kanto, which I feel is ridiculous since, especially when you’ve just transferred a Meltan over and that little nut can be a nightmare to catch. As for the Pokémon you don’t catch, they can remain in in the various parks you create, but there is a capacity of 1000 Pokémon, so feel free to go nuts, just not too wild. Another thing I’ll mention about capturing Pokémon in GO Park, is that they will feature the same capture rates as their outside counterparts, so don’t be surprised if you have to use a berry or two and an Ultra Ball. But what if you have 25 of the same species of Pokémon transferred? Well, you can play with them. For example, with Play Yard, players must herd the 25 Pokémon to a gate, whilst avoiding other Pokémon that strive to obstruct you. Still, that’s enough about what’s gone/altered, it’s time to start talking about everything else and wrapping up my portion of this review so that Mike can get round to taking you on an extensive tour through gameplay. So, to talk about what’s new, although the Let’s Go games strive to be like the Yellow games, which includes focusing on Kanto only Pokémon and including their baby and evolved forms, it does have two entirely new Mythical Pokémon and Mew. For the Shiny Hunters among you, you do not need to obtain them to complete your Pokédex and be awarded a Shiny Charm, but if you want them, you will have to pay the price. Then in Meltan’s case, you literally have to connect Let’s Go to Go, get the mystery crate that is vital for making Meltan appear around you in Go and catching as many Meltan as you can within 30 minutes before being allowed to try again seven days later. What’s worse, is you will need to get as many as possible, since 400 Meltan candies are required to evolve Meltan in Pokémon GO. Once you have your Melmetal though, you can then transfer the genderless Mythical to Let’s Go. However, any and all (including Alolan forms of Gen 1) Pokémon transferred to Let’s Go, can’t be transferred back to GO. Once a Pokémon leaves GO, they are GONE and that’s the end of it. So, be sure to keep that in mind. Then of course, we have the game’s story, visuals and soundtrack. For the most post, Let’s Go is very similar to Yellow. You play as a trainer from Pallet Town, with a best friend in the form of your rival and the game is your journey across Kanto, attempting to beat all 8 gyms, to prove yourself worthy of taking on the Elite Four. Only, there is more to the original adventure then just that though, since for the most part Let’s Go does try to mimic Yellow, it heavily borrows from games that came after it. Breeding may be off the cards, but Shiny Pokémon can be caught and found, Gym Leaders can be challenged again in the post-game and there are plenty of clothing sets to be earned and worn by both your character and your Partner Pokémon. That’s not all the chibi re-imagining has to offer though, as on top of the awesome HD renders of Pokémon and their amusing animations, there are 153 Master Trainers for players to find. You are not required to fight all of them, but you will need to fight the majority of them and there is a Master Trainer for every Pokémon that can be obtained and used in Let’s Go and victory over them, will earn you a title that you can use when battling online against other players. For what it’s worth, the online is so bad and plain (straight up link trade with local and faraway internet players and battling) that it makes me miss the Festival Plaza as seen in the Gen 7 games for 3DS. The online is almost as bad as the character designs. Sure, the graphics make the world and Pokémon of Kanto feel alive and thriving, but the NPCs and characters, all look a tad too childlike in my book. Still, the soundtrack is a magnificent work of heart that improves upon what original players were graced with and helps make the whole adventure feel all the more worthwhile. So it’s certainly worth having the volume on, as opposed to off and with that, you’re up Mike! Pokémon: Let’s Go, Pikachu! and Pokémon: Let’s Go, Eevee! combines the gameplay mechanics of Pokémon GO and the mainline Pokémon games. Navigating the world and Pokémon battles are very much like you would expect from Pokémon games. Battles are taken in turns with the fastest Pokémon normally going first. You will be given three options in Battle; Fight, Pokémon and Bag. Fight allows you to attack the opponent’s Pokémon or help increase your own stats depending on your chosen Pokémon’s move-set. You can choose to swap your Pokémon to a more suited Pokémon that has a type advantage or one that you are trying to train up. In Bag, you can use items to heal your Pokémon or temporarily raise its stats. Catching Pokémon is completely different from the mainstream Pokémon games, as the original formula has been replaced with one from Pokémon GO. You essentially have to throw Poké Balls at the Pokémon in an attempt to catch them. There are two rings that appear on the screen. The white ring is the base area where you need to throw the Poké Ball. The inner ring starts out at the same size as the white ring and gets smaller and smaller until it is no more and returns to the same size as the white ring. It then repeats the process of shrinking. The main idea is to throw the ball within the shrinking ring. The smaller it is, the more chances you have of catching the Pokémon and getting a Nice, Great, and even an Excellent bonus. You are also encouraged to catch plenty of Pokémon from the get-go. The more Pokémon you catch of the same species, will chain up bonus points and increase the chance to get better items. Transferring Pokémon to Professor Oak also nets you candies that you can use to make your favourite Pokémon stronger. Both versions of Pokémon: Let’s Go have their own exclusive Pokémon. For example, in Let’s Go, Eevee!, you can catch Meowth and Vulpix who are not available in Let’s Go Pikachu. Whereas In Let’s Go Pikachu!, Growlithe and Sandshrew are exclusive and are not catchable in Let’s Go, Eevee!. Now, although only Kanto region Pokémon can be caught in Let’s Go, you can however, trade for Alolan form versions of certain Pokémon like Rattata, Meowth, Sandshrew, Diglet and Raichu. Trading requires you to have the Kanto version of them and is done by exchanging the Kanto version with select trainers at Pokémon Centers. There is no limit either so you can trade as many times as you want. Trades are also not shiny locked, so shiny Alolan Pokémon can be acquired. To trade Pokémon with actual players though, you will need to be connected to the internet or via Local Wireless. Once connected, you can choose to trade or battle other players and even set your own rules to play. You will be given the option to type in a special code using Pokémon sprites which you can share with your friend so they can connect with you. Try to make the code something unique so that no random person connects up with you and tries to trade your offer you a Pidgey for your Hitmonchan or something. As you play, you can choose to play alone or with a friend at any time when playing in docked or tabletop mode. By shaking a second Joy-Con. A support trainer will come onto the screen and can team up with you in battles or lend a helping hand in catching Pokémon by doubling your chances of a successful capture. You don’t even need to play with a friend as you can easily control both players independently with single Joy-Con in either hand. There are three different controller options that you can use to play Pokémon: Let’s Go. You can choose to play using a single Joy-Con, in handheld mode or by using the Poké Ball Plus. Each control style has its own control layout. The single Joy-Con has a separate button for everything. The menu is accessed by pressing the X button. A is to interact and accept options and the Joystick moves your character around and navigates options. The Poké Ball Plus has only three buttons that are incorporated into the body of the Poké Ball. The joystick is positioned on the button of the Poké Ball. The Menu button is found on top of the red part of the Poké Ball Plus and pressing the Joystick in works the accept button. Both Joy-Con and Poké Ball Plus have to be thrown towards the screen (without letting go of course) in order to “throw” a Poké Ball in the game. This is a cool little feature but it can rub a little thing when trying to catch your umpteenth Pokémon and your arm is beginning to get tired. If you are not good with your throws, you can waste a lot of balls which in the beginning of the game are pretty costly. As you battle more trainers, you will earn plenty of cash to keep you in Poké Balls but throwing them willy nilly is still not a luxury anyone can afford. Handheld mode offers a slightly more traditional control scheme. With separate buttons for everything and no need to throw a controller. Instead, you have to rely on gyroscopic controls to maintain the Pokémon as central to the screen as possible and then press A to throw the ball. One of the biggest let downs though, is the lack of Pro Controller support. When Pokémon: Let’s Go Pikachu! and Pokémon: Let’s Go Eevee! was originally thought to be heavily influenced by motion control, it was understandable why the Pro Controller couldn’t be used. Unfortunately, the gyroscopic controls in handheld mode do make mockery of this as the Pro Controller could easily be used to “aim” where players could throw the ball. I have noticed some serious slow-down in handheld mode when a lot of Pokémon appear on screen. Around 5 on the screen at once is bearable, but should you find yourself inundated with Pokémon everywhere, the gameplay slows down tremendously. I haven’t experienced performance issues anywhere else and battling seems to be okay with no noticeable drop in framerate. This return to Kanto is a lot like visiting your childhood home after being away for a very, very long time. There’s plenty of familiar faces and sights, but the ravages of time have taken their toll. What was hip and engaging when we young, is now out the window as everyone is now caught up with the latest fad and in the case of the Let’s Go games, that fad is Pokémon GO. Whether long-time fans like the new tweaks and changes, Let’s Go is precisely what it needs to be, for the newer crowd who have came after us. Pokémon: Let’s Go is ideal to players that have not really played a core Pokémon game in years or even not at all. I grew up with the original Pokémon Red/Blue/Yellow games and the OG 151 Pokémon will always be My Pokémon. The inclusion of Mega Stones for Mega evolution and the revamped catching mechanic in my mind, are welcome additions to the modern/classic gameplay of Pokémon: Let’s Go. Seeing all of my favourite Pokémon in the overworld, wandering around or scampering about really made the game feel much more alive and I am quite happy to spend more of my precious time roaming the wonderful world of Kanto. Let’s Go are not the Pokémon games that die-hard Pokémon fans want, but they are the ones we’ve got right now and whether you choose to cut your nose off and spite your face by not indulging in it, or try something new and give it a go, the fact of the matter is the world of Pokémon is well and truly alive on Switch and we simply refuse to miss out on the new opportunities this world offers. How about you? Simpe but fun game. I would definitely recommend. Here’s an article about the game for a different perspective.